Wired Magazine came up with what probably wouldn’t be considered a conventional infographic by today’s standards, but is a throwback to where infographics came from. Shaped like the food pyramid, this condensed media diet approach is just what might remedy scores of information loaded readers. With a sectional look at all of the different ways that people spend their time online, we might see a move of infographics towards this style, tending to the most important reasons why infographics exist in the first place – to visualize the data. PRO: Brilliant 3D design that provides quickly consumable information. It’s immediately engaging. CON: The unhealthy message of telling their readers that they should be “enjoying media” for 9 hours a day! Infographics have really been around for a couple of decades; traditional print media has long featured graphic-dominated presentations in places like the color front and back pages, often covering topics like intriguing statistical sporting events. But it has only been the last couple of years that they’ve become the go-to representation on the web for teaching an audience about the numerical, in a sleek and distributable format, which often goes viral when done right. In this post we present to you a range of 10 contemporary infographics and some key takeaways that you can gain from each individual design. It should be noted that infographics really come in all shapes and sizes – but there are important differentiators that make some spread more widely, convey a real message (opposed to pooling “related” statistics together for “organization’s” sake), are clear in routing the reader along a relevant path(s) and use design elements that offer a helping hand in the information consumption process. Cool Infographics highlights an infographic made by Airbnb, an online booking service for competitively priced lodging at unique locations. This is a classic example that showcases the geography of the company’s success, which works out nicely as Airbnb hosts travellers from around the world. The stunning maps paint a definitive picture of their phenomenal global growth from 2011 to 2012. Comparisons are always an effective measuring tool when trying to get a proper perspective and Airbnb does just that on the infographic by adding to what the public uses their site for (booking) with the notion that their users have taken more photos than the British Museum’s drawing collection or that of the total number of object’s in the Louvre’s collection. In pivoting mode, Airbnb’s infographic has made it clear that their 24/7 and 366 days a year (it’s a leap year!) customer service availability is a strong benchmark for how their web service should be admired. PRO: It does a great job of showing the view Airbnb’s growth through data. The viewer immediately understands how much Airbnb has grown. 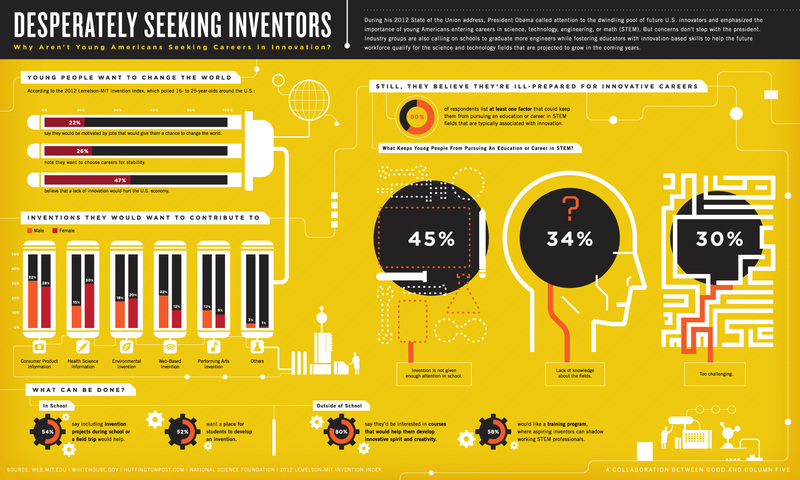 CON: This infographic weighs heavily on the self-promotion side. Generally, the best infographics are those that help people understand a complex set of data relevant to their industry. Infographics that are completely about the company that created the infographic lowers the trust around the set of data. Felton, co-creator of the data gathering site, Daytum and NYC based graphic designer, created a cluster of infographics that sizes his life for the year of 2008. His annual reports are really extraordinary as they are multi-layered. “The Measure of a Year”- goes through his personal mileage, foody habits and tastes and then forays into showing his exact movement in the places he was in most. The typography helps this infographic come across like a small e-book- no detail is left behind. Definitely on the higher end of infographics, but still out for the average reader. For a person to share this type of statistical degree of his life is truly remarkable. PRO: It is a bit dated, but it’s an excellent example of a data visualization with minimal amounts of text. Magnitudes have been turned in to geometric shapes, where the viewer can quickly see where the subject’s time has been spent. CON: Allowing viewers to see a larger version of this first page would be helpful. Hollywood Backstage in this infographic conveys the relief well and sub-sea containment progress during the 2010 BP oil spill disaster. Accompanied by an article and video, this is an interesting case of melding data with news. The infographic contains the necessary metrics of scale and encourages the reader to continue onto the body of text that follows the graphic. The current status of the relief plan was just starting when this infographic was released, but the best thing about this infographic is that is freezes an otherwise hectic space in time with a calming snapshot of how to fix a serious environmental misstep. PRO: A well-made infographic can be an excellent way to show the world how you intend to solve a huge problem. CON: The surrounding context of the terrible incident evokes negative emotion making it hard for the viewer to be objective. Feilding Cage from Time, designed this infographic with interactivity in mind. The density and lack of population in American municipalities are some of the “hints” that the infographic gives the reader from a handful of dots on the map. There’s not too many options when it comes to learning from the roll-overs and there is only one prominent color utilized- both of which really work in favor of the main idea of this infographic: where people live and more importantly where people are migrating to. PRO: This is probably the best representation of the U.S. population based on geography ever (thanks to it being three dimensional). You can instantly decipher where most of the U.S. population lives. CON: Lack of heading and description. It would help if it was clearly announced that the graphic is showing population density. Web performance optimization gurus, Yottaa, outline in a 3 color scheme, all of the trends in tech jobs that you need to know about. What’s nice about this infographic is the simplicity of the marketing mix of the different types of charts that expand upon their core proposition. It’s not the most elaborate IG, but it certainly gives the reader a taste of what great iconography is all about- best depicted in the ‘reap the benefits’ section. Dog, beer friendly and gaming rooms- come on, if this infographic doesn’t show prospective students what area of work to get into, don’t know what will. PRO: Very little use of text. If you have to read an infographic, then it should just be turned into a blog post. CON: Not very visually appealing and is missing key data (like who is the #1 company to work for?). This infographic could of used a little more help in the design department. The Cloud Infographic, a site that is determined to understand cloud computing by the use of infographics, needed a way to sort out the hundreds of online project management software possibilities and they did this with the help of this GetApp.com IG, which did exactly that by boiling it down to a selection of 25. What immediately stands out is that the infographic has been gamified. The “contenders,” big and small are bundled together, only to be separated by their attributes in the following sections. There’s a neat ‘check box’ section which shows which solutions have which capabilities and what is most likeable about this representation, is the ‘further reading’ link for those that were unconvinced with GetApp.com’s argument. PRO: This is a very helpful graphic for helping one decide on a project management app. Considering the amount of data one would have to sift through and the sheer number of sites they would have to visit, this graphic does a great job on helping the reader out (especially the Social Media Presence information!). CON: The hospital interior color theme is somewhat of a turn off. The Pure Infographics blog gives a heads-up to a Column Five and Good collaborative production, an infographic meditating on the fact that there’s a lot of young talent who want and can change the world, but in reality have no effect. This uses a not yet popular, but clean, horizontal layout of the IG, which really stands out. Presents the problem solution of how inventors could be able to change the world and there is great color coordination in general, which brings the right facts and statistics to light. PRO: Excellent sources. The higher quality and more trustworthy your data, the more likely others will trust your infographic! CON: The most important statistic (“80% say they’d be interested in courses that would help them develop innovative spirit and creativity”) is one of the smallest visual elements. The Blog Herald in partnership with Infographic Labs, goes from Twitter’s history to the state of the micro-blogging service in 2012. The use of photos almost seems like taboo in the infographic world, but they pulled it off and leaves to wonder why this is not done more (should graphic designers make friends with photographers?). The IG is not saturated, as is demonstrated in the case of the history portion, which outlines the rise in 6 dates. It doesn’t hurt either that the designers seemed to have had a field day with using bright colors, something which might seem over the top, but really makes the infographic pop. PRO: Excellent selection of data that is helpful for marketers (especially towards the bottom). CON: The design is a little overwhelming, which can cause viewers to click away. 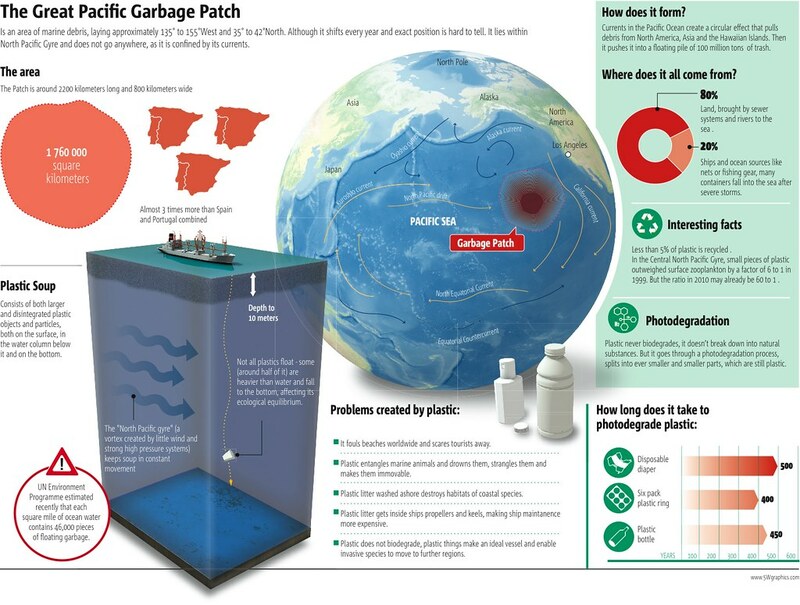 Metrobest on Flickr, which offers a cash prize to award winning pages, published this infographic that exposes an unmovable and gigantic lot of trash located in the North Pacific Gyre. Clearly presenting interesting facts is what this infographic is all about- all of the originating problems of this mess is what the design of the infographic performs well at and sticks to. And by hosting with Flickr, this infographic has the potential to be shared and re-sized with ease. It would be great to see a follow-up infographic with the solutions of how to clean this area of debris up in the future. PRO: A very comprehensive and easily digestible arrangement of information. Does a great job of highlighting the importance of this environmental issue. CON: Somewhat heavy on the text, but in this case it’s necessary. With this said, if there are any important examples that you feel should accompany this list, please drop a comment below! Hungry for additional infographics? Check out the KISSmetrics archive of 40+ infographics here. Siguiente Entrada siguiente: How to Get More Comments on Your Blog?